The Curriculum • What are you Wearing Today? Post subject: What are you Wearing Today? Shall we add a sticky for our own WAYWT? Today, I am a man of action! Following the example of Patrick, I though I'd spice up my dull photos - it's a start. BB makers tie - print - navy ground with white flowers with pink centers (my first ever BB tie - I got it to match my first BB shirt - a pink gingham shirt I got for Christmas from my in-laws about 7 years ago). 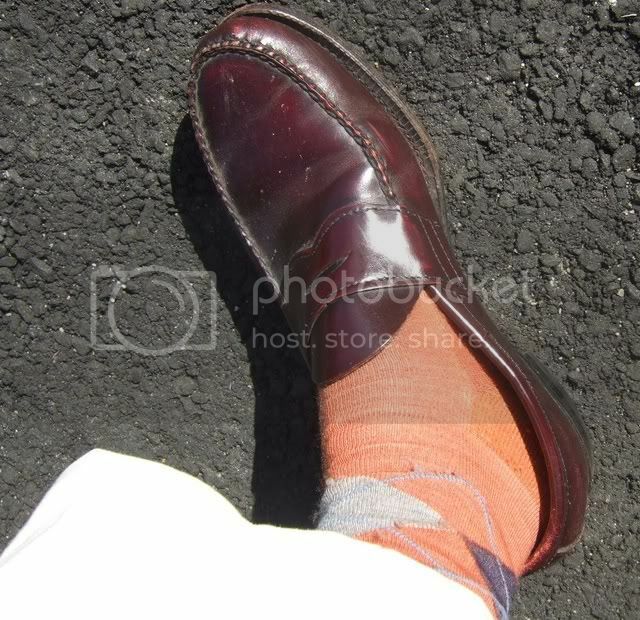 Alden for BB plain toe bluchers - no matter how hard I brush, or use Lexol cleaner wipes, I can't get that crud out of the creases. The prior owner must have polished them and left on a lot of wax that I cannot get off. I really don't want to use nail polish remover on 'em lest I wreck the otherwise nice brown color they've taken on. Oh well. Have an action packed day, all! Post subject: Re:What are you Wearing Today? Nobody asked, but I'll cast my vote for don't-post-if-you-don't-have-a-picture. I rarely post on the AAAT WAYW for this reason. And I don't stop to check out anybody's get-up if there's no picture, which means I'm generally only looking at the contributions of Patrick, Mac and relatively few others. It gets boring quick when people just say "I'm wearing X shirt, Y jacket, Z pants," etc. So let's make it interesting and worthwhile. Post a pic! Lookin'good, PC. I must find a navy blazer with a patch chest pocket. I have purchased two, but neither worked out. I checked the BB site everyday for months when the university blazer went on sale. My size never showed up. I think the shoes look great the way they are! Squire may have beaten you to it. Post subject: What was that about a Green Landie? Post subject: Re:What was that about a Green Landie? Scott, button stance looks fine to me, but maybe I'd feel differently if you were standing. That's a perfect September coat. Still cool enough for warm early fall. Not too summery to make people think you think it's July. 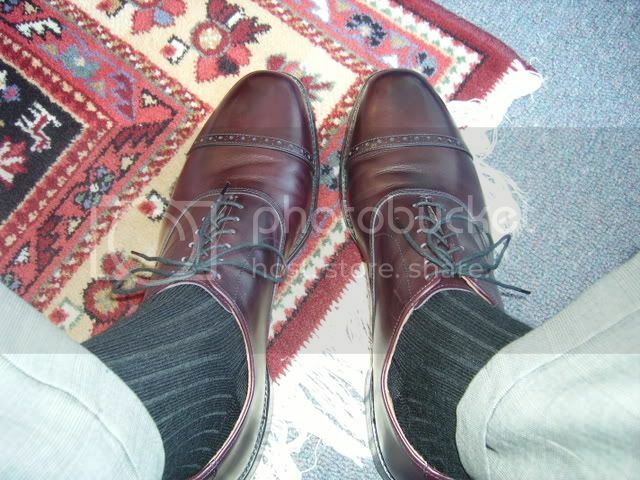 I have a Southwick in wool/silk, similar color with a blue windowpane. Really only worn in September. Love the Land Rovers, Scott! wnh: I totally agree. Pics or bust! NG - awesome ride and great outfit. Beautiful coat. Another jeans experiment. Two button tweed sack from Eljo's. Looking good Patrick. I've found that combination to be a look that sets a man apart from the hoards of "business casuals", but still doesn't make them too nervous and back-biting. 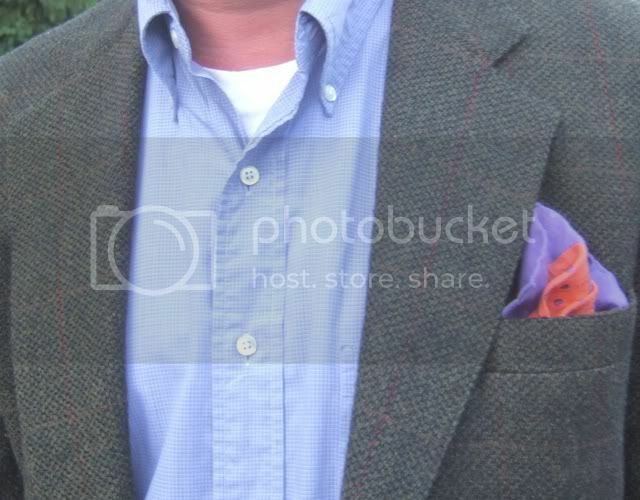 I've heard it said that the pocket square is the new necktie. 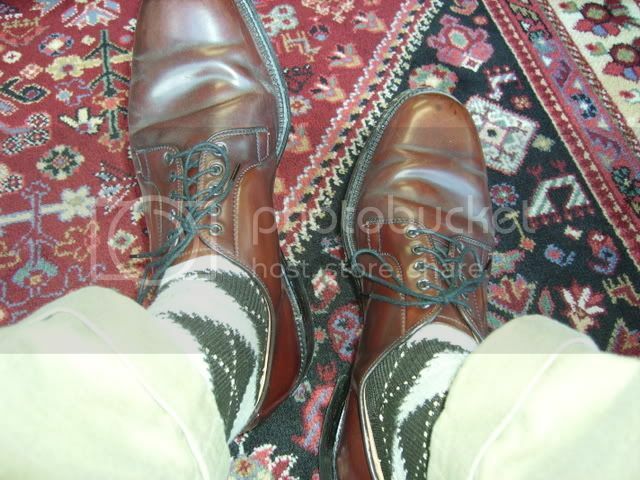 I'm not so sure about that, but they do add a bit of flair when the tie is omitted. Is unbuttoned the new buttoned? Nice coat, regardless. 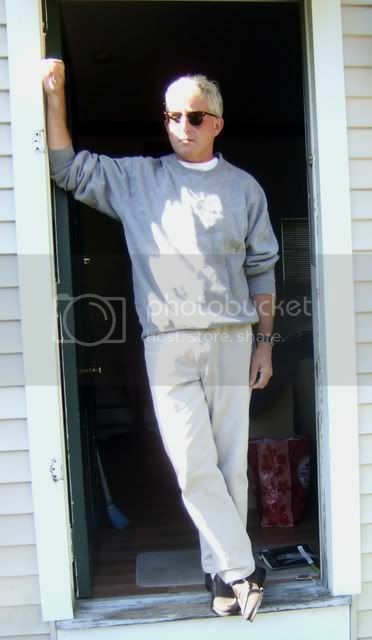 Edit - I thought those were khakis until I read your blog. I can't think of jeans as anything but blue, unless maybe they're cut really skinny. Joe, the stance isn't horrible, just lower/closer than the BB/J Press standard I have come to prefer. I'll continue to cast about for a better source. I'm waiting on a BB "Select" jacket now. If that works out, the BB Select program could change my entire attitude regarding BB. If you have a Corporate Card (a great reason to continue supporting AAAT), the price is far better than Southwick MTM. And a BB credit card gives you an additional 4% rebate. Still not exactly cheap, but worth the premium to get the cut you want, and not having to worry about your size being in stock. Every mall BB has the Select books. Thanks, jpe, Clip. It drives like a mini pulpwood truck, but I love her. More court attire today. 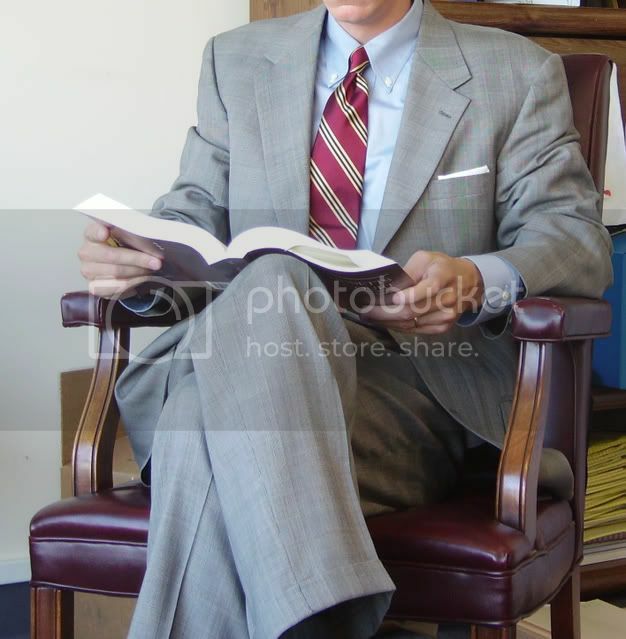 Funny thing, in the district court I was in today, I was one of three lawyers (out of about 15 I saw in the courtroom) in this exact tie! 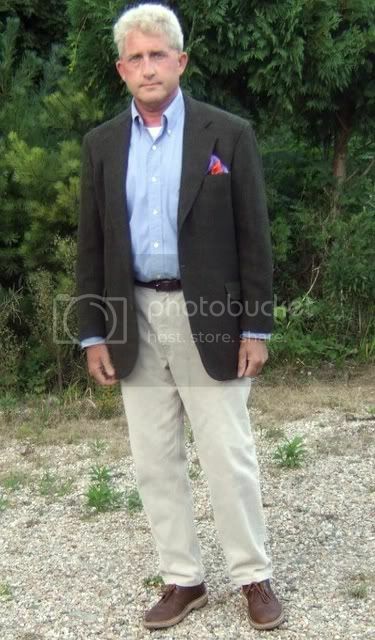 "Daniel Hechter" glen-plaid Am-Board suit bought from Filene's Basement pre-clothing education. 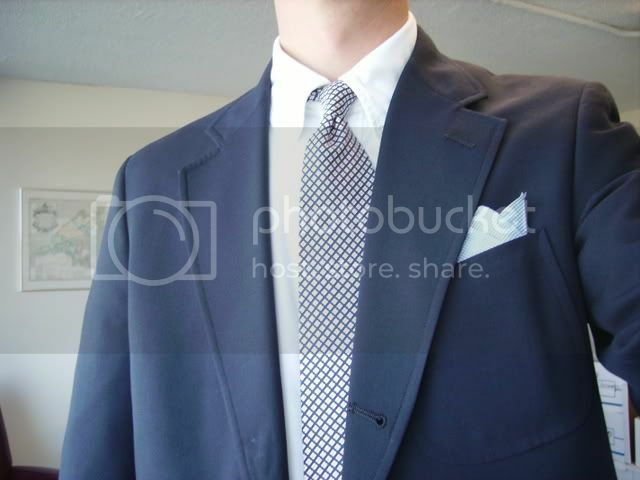 Darted 2B, wider lapels, no vent(!). 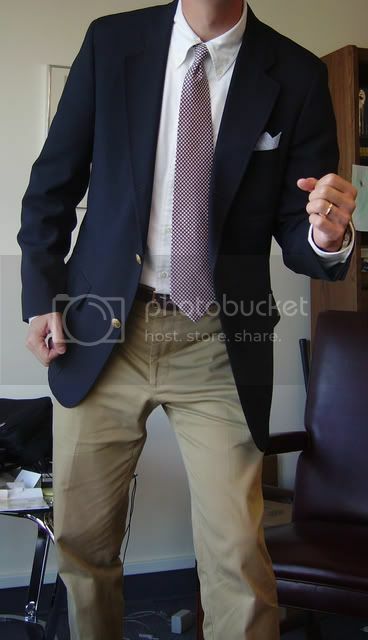 The suit actually surprised my by being Made in USA. It is a 42L. I have since realized I need 41L. The shoulders get a bit wide although they are relatively lightly padded. BB makers tie. Width is 3.5", but it seems wide to me. White hankie PS. Respectful TV fold (I just turned my 4 points fold upside down). BB slim non-iron pinpoint BD. Not really an action photo, but beats standing like a stiff. ^Nice job. 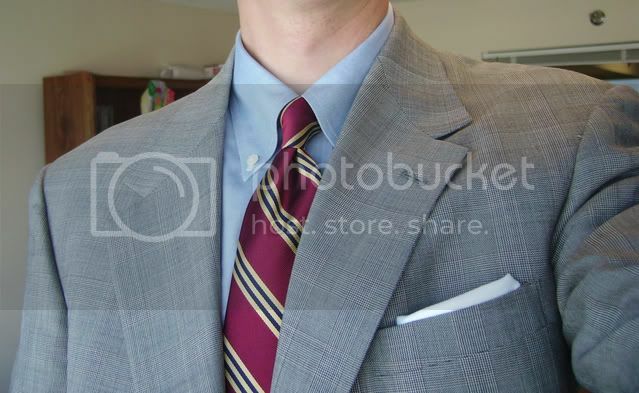 I have a few suits in that vein, and they look good, although I usually wear a point collar with them. Figure as long as I'm departing from orthodoxy might as well go all out. I have only 1 point collar dress shirt - a white one for interview or funeral. Even before I got all clothing edj-a-ma-cated I have never really cared for points and so reserve my one shirt for emergency important use. Taking a little goddamn sun and trying to read this crumby book. Old Mrs. Peel is coming over in a while and we're going to the thrift store.